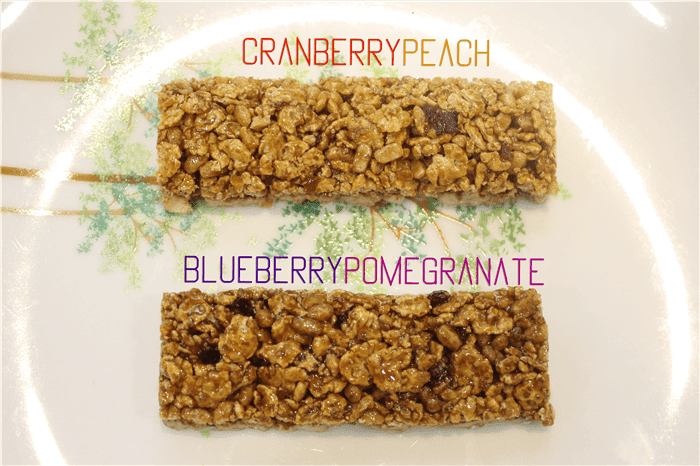 Yogood Glow Muesli Bars has debuted two flavors, BlueberryPomegranate & CranberryPeach. Yogood Glow Muesli Bars is a yogurt coated cereal bars with multigrain flakes and fruits (Blue & Pomegranate / Cranberry Peach) with less than 100 calories. 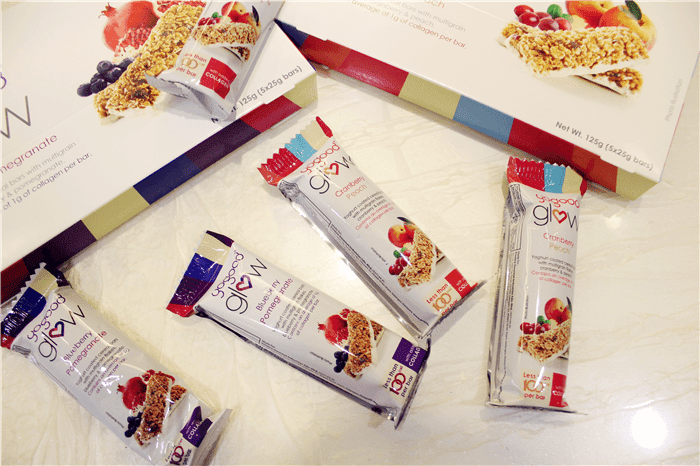 Each bar is high in dietary fibre and contains an average of 1g of collagen inside. As I mentioned just now, I really like the concept idea combination of healthy cereal bar with addition of beauty ingredient inside. Besides than dieting, it also helps to improve skin texture and looks younger. How awesome was that!! 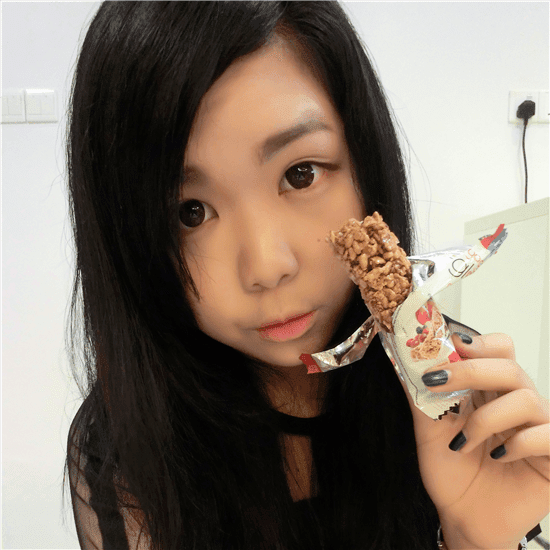 As always muesli bars is also consider as energy bar and breakfast/snack-on-the-go. This product was currently my breakfast-on-the-go. As for the taste, both are yummylicious. I am more to blueberry and pomegranate flavor because both are my favorite fruits while my elder brother is more on cranberry and peach flavor. Is kinda surprising when my brother are fall in love with this muesli bar because he is never a fans of yogurt and muesli bar. 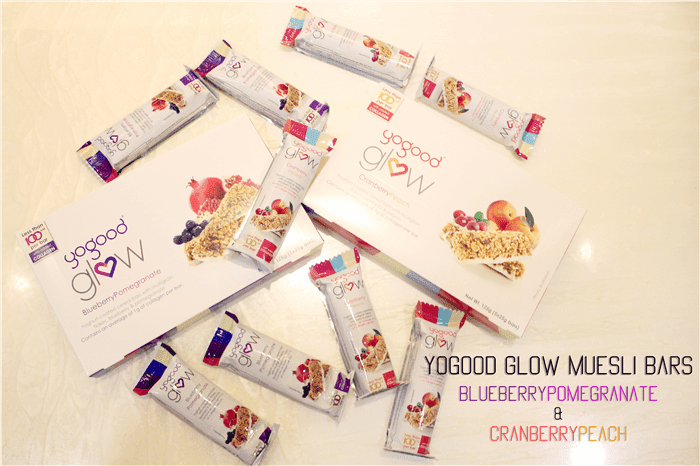 Yogood Glow Muesli Bars contain 5 bars in one box. One thing has to be highlight is the collagen was extract from beef 4.5% palm fat. So, a gentle reminder here that this might not suits everyone to consume especially vegetarian consumer. Personally, I am good to go with it. 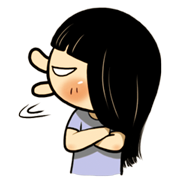 Another reminder here, please do not store your muesli bars into refrigerator because it will turns quite hard to bite. 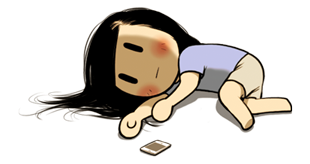 (Lol... Yes! I tried before ahahahahaa). Room temperature is just perfect to consume. Wanna to win awesome prizes? Then Yogood should fulfill your dream!! 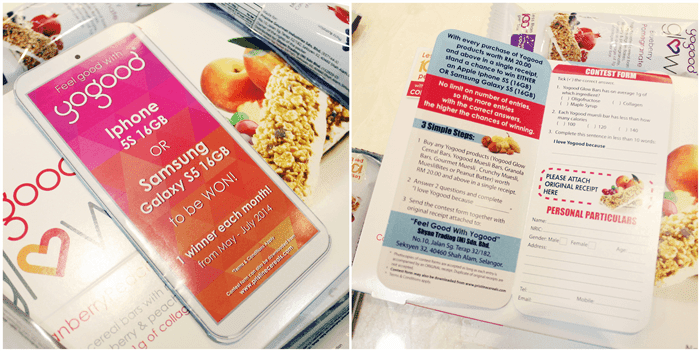 Did you know that Yogood is currently running a contest, 'Feel good with YoGood'. then stand a chance to win a Iphone 5S (16GB) or Samsung Galaxy S5 (16GB). With no limit on number of entries, so the more entires with the correct answers, the higher the chances of winning! Purchase Yogood products, fill up the form and send to Yogood. 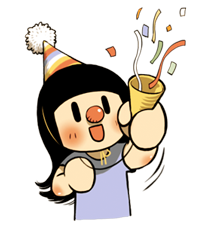 *Contest is running from May until July and 1 winner will be selected each month. thats interesting.. do you know if they have it in singapore? 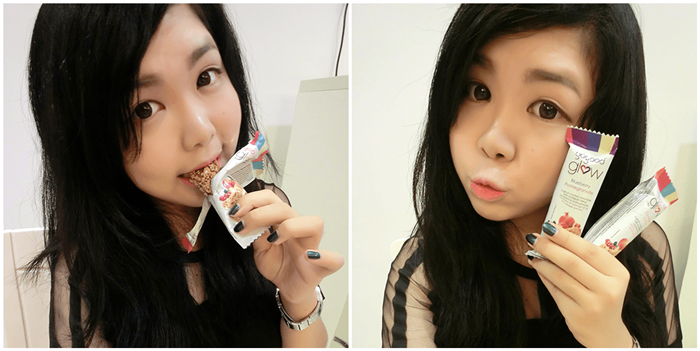 Singapore should start selling the Glow cereal bars around July/August. 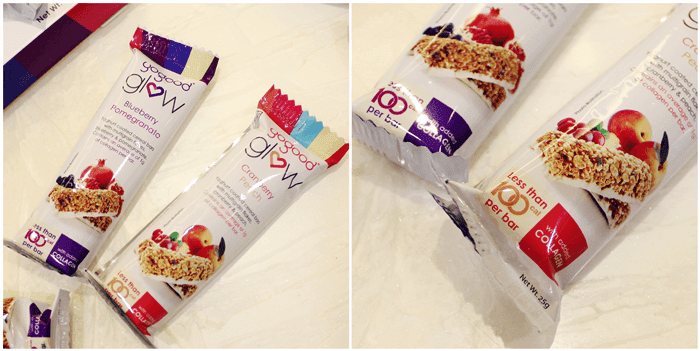 We have other range of Yogood Muesli Bars (not the Glow series) which are available in NTUC Fairprice and Cold Storage.